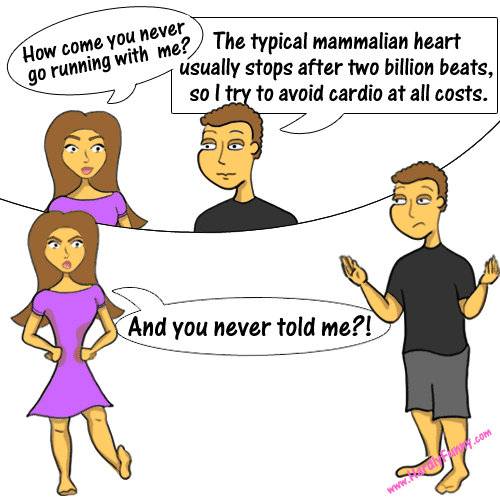 I’ve done some research after rudely finding out Randall was watching me use up my limited amount of heartbeats….I found that most sources say mammal and human hearts will beat between 2 and 3 billion times. That’s a pretty big discrepancy, but it depends on how long the person lives. The worldwide average life expectancy is supposedly 65 years old (2 billion beats), but I might be lucky enough to reach 95 years of age (3 billion beats). All in all, doing cardio regularly actually slows your sitting heart rate and therefore helps you out in the long run. Hah! (I made a pun.) So Randall started running with me! 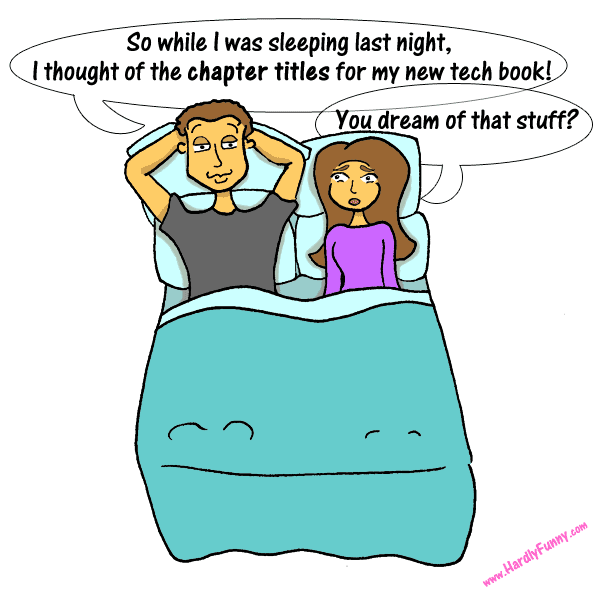 My husband doesn’t always code in his best dreams… He designs things, like ebooks or rest APIs. I get to hear all about it in the morning! I fill him in on my dreams- usually something about me and our chihuahua, Scribbles. Randall loves updates (and watching progress bars load). 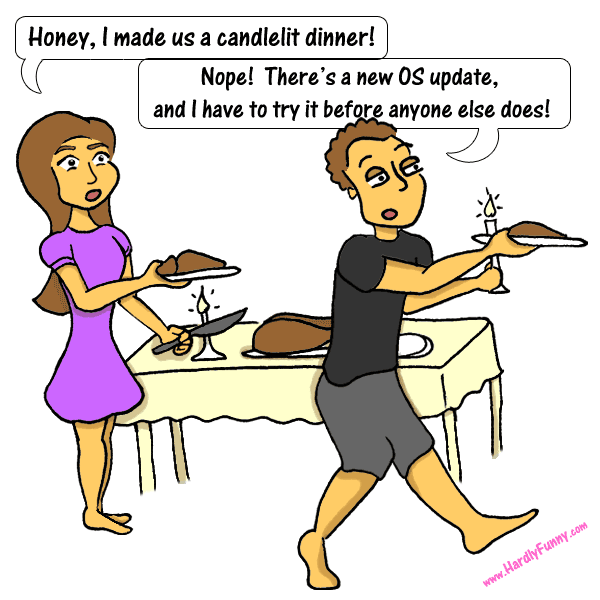 He reformats for each OS update, which can take hours! I guess I’ll be learning UNIX. I knew it was coming to this, because he tries to reformat my computer with different operating systems when I’m not home. I’m sure UNIX is great. I just didn’t know that we were ready to take this step together. Gulp. We are moving again in three weeks to San Francisco/East Bay area to attend fellow hackathons and such. 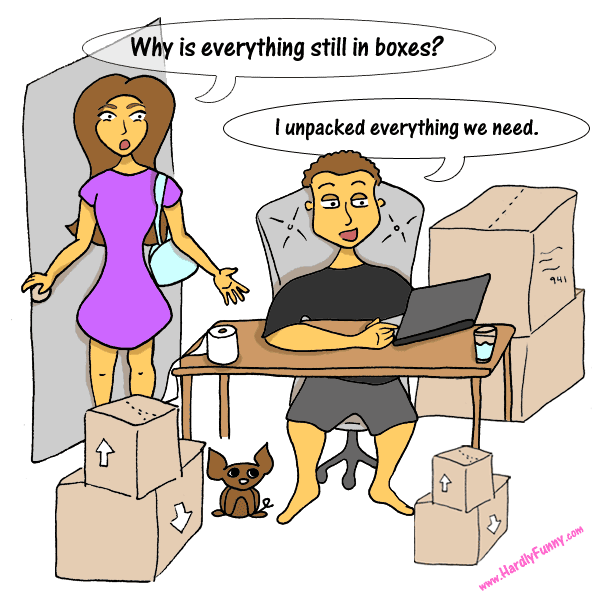 The last two times that we moved, I worked full time and left the unpacking to Randall. It turned out like this image above each time; he only unpacked his laptop and some books on hacking. That was it! He didn’t see the problem, just “the essentials”. 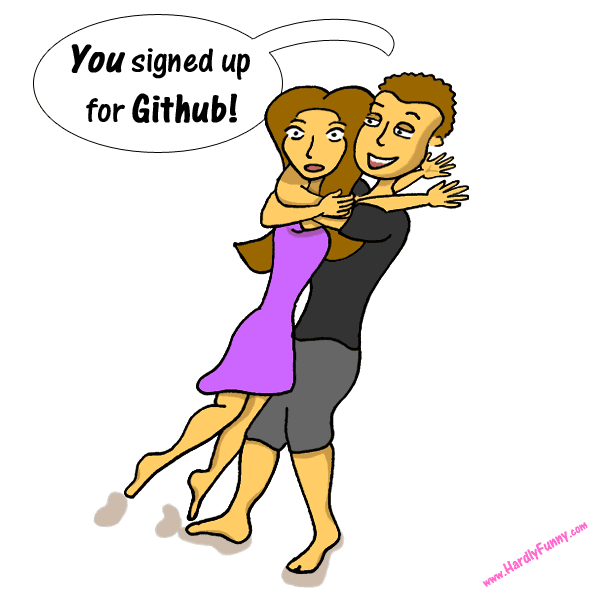 Randall went ooh la la over me when I made my first Github account and repository this week! I will use it for my new static html site that I plan to host through Amazon Web Services. Dating a developer can be lonely if you’re not a developer yourself. You may notice that there are definitely less people around, few social outings and lots of solitude and indoor time. Well, developers are not always antisocial; they just socialize online with selective humans and bots. I finally got to meet my honey’s friends online through a mystery called IRC. I was immediately lectured for referring to Randall as Randall since he preferred his alias or handle at the time (which was in leet speak!). His friends only knew his identity by his handle so I just confused everyone. I felt really bad, like I made a embarrassing impression. I’m glad everything worked out though. You learn something new everyday when you date a developer!